have picked up the habit of grabing my son David a little gift when ever I do have to go out of town. My wife and I spent this past weekend in Charleston, attending the New Wine conference at St. Andrew’s Mount Pleasant (fantastic!) as well as getting some much needed one on one husband and wife time. We left David in Myrtle with his godparents. On the way home we stopped at Barnes and Noble and were pleased to see that they carried the Jesus Story Book Bible. Having received many good recommendations about this children’s Bible, I sat down and read a few of the stories and quickly determined to purchase it for David. Let me just say before we get too far along, I’m very excited about this book, not only for David but also for myself and Stephanie. As Dr. Tim Keller has said, “I would urge not just families with young children to get this book, but every Christian.” This may sound like a bit of an exageration, but having read through it I must agree. This is a great book for kids, but I’m ready to go ahead and go out on a limb, adults should purchase this book. Seminarians should purchase this book. Pastors should purchase this book. And yes, it’s just a children’s Bible. So what makes it so good? 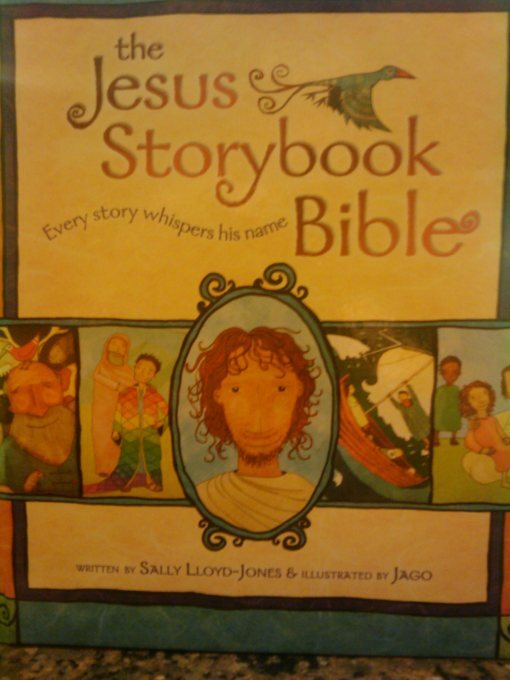 The full title of the book is The Jesus Story Book Bible: every story whispers his name. Many Christians have a difficult time connecting the Old Testament with the New Testament. Like many children’s bibles, the The Jesus Story Book Bible covers the major episodes of the Old Testament. However, unlike many children’s bibles, The Jesus Storybook Bible links every story in the Old Testament to Jesus, and applies the Gospel to every story in both the Old and New Testaments as part of the lesson. For example, below is a caption from the creation story in Genesis. This is the Jesus Story Book Bible’s version of the creation. Note how this Bible is preparing us for the fall as well as for our redemption. 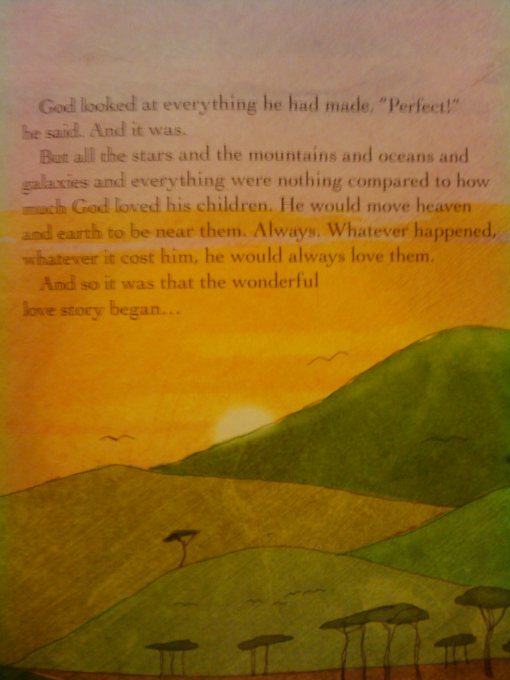 “God loved his children,” the story reads, “Whatever happened. Whatever it cost him, he would always love them. Just as the cover advertises, ever story whispers his name, and this Bible is very good at whispering the name of Jesus in ever story, as well as his highlighting his marvelous and merciful work on the cross. This will not only help children connect the dots between the O.T. and the N.T., but I think it would be a great help to adults. It might surprise you to hear me say again that I think adults should purchase this book for themselves. Let me give two examples. A good friend of mine, and fabulous preacher, Hamilton Smith, has already confessed to using some of the points made inThe Jesus Story Book Bible in his sermon prep. And before you pick on Hamilton for using a children’s bible for sermon prep, consider that the famous preacher and author, Timothy Keller, uses the story of Abraham and Isaac from The Jesus Story Book Bible almost word for word in a conference message about the church engaging postmoderns. That’s how good this children’s bible is. It’s not just the content that impresses me. I consider the artwork to be outstanding and highly engaging. David loves it, but so do I.